10. The Lutheran Study Bible’s hardback edition is burgundy, a beautiful color, with a Luther Rose stamped on the front cover. Big “wow” factor. Need we say more? 9. The Lutheran Study Bible is available in a larger print edition, as well as a regular print edition. Not that our eyes are getting older, type is just getting smaller. 8. The Lutheran Study Bible has better cross-references than any other study Bible available today, carefully prepared and supplemented with historic Lutheran cross-references and notes dating back to the Luther Bible of 1534. It is chock-full of historic Lutheran goodness. 9. The Lutheran Study Bible has thirty-six custom-designed maps, which are linked to from over 880 references throughout the Bible, more map references than any other Bible. Especially helpful for some of us who refuse to stop and ask for directions. 8. The Lutheran Study Bible has over 31,000 concordance entries, helping you locate important topics and issues throughout the Bible. If you check one reference a day, the fun won’t end for 84 years! 7. The Lutheran Study Bible has more notes than nearly any other study Bible available today: over 26,500, all researched, written and edited by faithful Lutheran Bible scholars, pastors and Bible teachers. This is most certainly true. 6. The Lutheran Study Bible has over 120 diagrams and charts, prepared exclusively for this Bible to highlight and underscore key concepts, terms, teachings, events and people in the Bible. We know you like pictures. We do too. 5. The Lutheran Study Bible has over 220 thematic articles offering discussions on a wide variety of topics, issues and concerns dealt with in the Bible. Faithfully Lutheran, practical and relevant: can’t beat that combination. 4. The Lutheran Study Bible contains an extensive introduction on how to read and understand the Bible, with reading plans, Luther’s Catechism, and all kinds of other helps. But wait, there’s more! 3. The Lutheran Study Bible contains many comments and insights from the entire history of the Christian Church: Early Church, Middle Ages, Reformation Era, contemporary theologians, drawing you into the rich conversation around God’s Word that has been going on for millennia. Pull up a chair, listen in and join the conversation. 2. The Lutheran Study Bible gives you practical helps and aids to strengthen your life of prayer and meditation on God’s Word with life-application notes and prayers throughout the Bible. A good study Bible does not have to read like stereo instructions. 1. The Lutheran Study Bible is the first, and only, study Bible in English prepared entirely from the ground-up by Lutherans, offering a uniquely keen focus on the proper distinction between Law and Gospel, shining a brilliant light on the heart and center of the Scriptures: Christ and Him crucified, risen and ascended for your salvation—its all about Jesus, in every way, for you. 12. 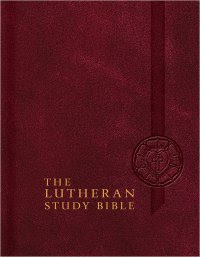 The Lutheran Study Bible’s hardback edition is burgundy, a beautiful color, with a Luther Rose stamped on the front cover. Big “wow” factor. Need we say more? 11. The Lutheran Study Bible is available in a larger print edition, as well as a regular print edition. Not that our eyes are getting older, type is just getting smaller. 10. The Lutheran Study Bible has better cross-references than any other study Bible available today, carefully prepared and supplemented with historic Lutheran cross-references and notes dating back to the Luther Bible of 1534. It is chock-full of historic Lutheran goodness.